Package image/draw defines only one operation: drawing a source image onto a destination image, through an optional mask image. This one operation is surprisingly versatile and can perform a number of common image manipulation tasks elegantly and efficiently. Composition is performed pixel by pixel in the style of the Plan 9 graphics library and the X Render extension. The model is based on the classic "Compositing Digital Images" paper by Porter and Duff, with an additional mask parameter: dst = (src IN mask) OP dst. For a fully opaque mask, this reduces to the original Porter-Duff formula: dst = src OP dst. In Go, a nil mask image is equivalent to an infinitely sized, fully opaque mask image. The Porter-Duff paper presented 12 different composition operators, but with an explicit mask, only 2 of these are needed in practice: source-over-destination and source. In Go, these operators are represented by the Over and Src constants. The Over operator performs the natural layering of a source image over a destination image: the change to the destination image is smaller where the source (after masking) is more transparent (that is, has lower alpha). The Src operator merely copies the source (after masking) with no regard for the destination image's original content. For fully opaque source and mask images, the two operators produce the same output, but the Src operator is usually faster. 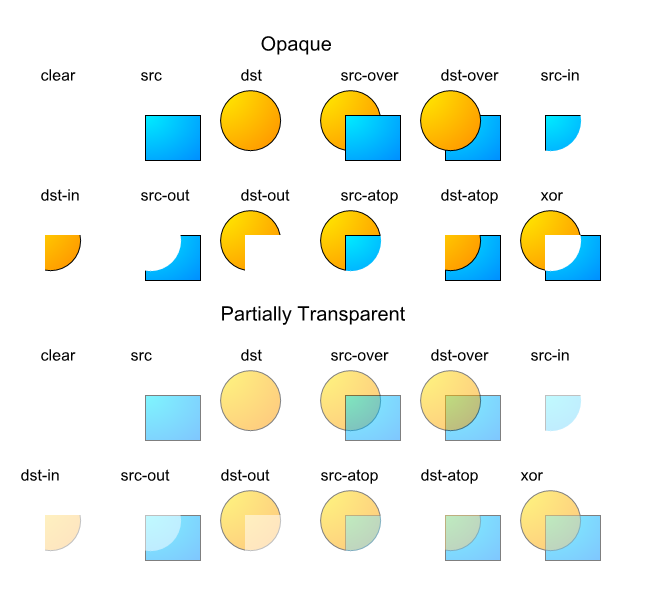 Composition requires associating destination pixels with source and mask pixels. Obviously, this requires destination, source and mask images, and a composition operator, but it also requires specifying what rectangle of each image to use. Not every drawing should write to the entire destination: when updating an animating image, it is more efficient to only draw the parts of the image that have changed. Not every drawing should read from the entire source: when using a sprite that combines many small images into one large one, only a part of the image is needed. Not every drawing should read from the entire mask: a mask image that collects a font's glyphs is similar to a sprite. Thus, drawing also needs to know three rectangles, one for each image. Since each rectangle has the same width and height, it suffices to pass a destination rectangle r and two points sp and mp: the source rectangle is equal to r translated so that r.Min in the destination image aligns with sp in the source image, and similarly for mp. The effective rectangle is also clipped to each image's bounds in their respective co-ordinate space. // Draw calls DrawMask with a nil mask. The destination image must be mutable, so the image/draw package defines a draw.Image interface which has a Set method. To fill a rectangle with a solid color, use an image.Uniform source. The ColorImage type re-interprets a Color as a practically infinite-sized Image of that color. For those familiar with the design of Plan 9's draw library, there is no need for an explicit "repeat bit" in Go's slice-based image types; the concept is subsumed by Uniform. // image.ZP is the zero point -- the origin. To copy the entire source image, use sr = src.Bounds(). // the effective rectangle is smaller due to clipping. To draw a font glyph in blue starting from a point p, draw with an image.ColorImage source and an image.Alpha mask. For simplicity, we aren't performing any sub-pixel positioning or rendering, or correcting for a font's height above a baseline. The image/draw package implementation demonstrates how to provide an image manipulation function that is both general purpose, yet efficient for common cases. The DrawMask function takes arguments of interface types, but immediately makes type assertions that its arguments are of specific struct types, corresponding to common operations like drawing one image.RGBA image onto another, or drawing an image.Alpha mask (such as a font glyph) onto an image.RGBA image. If a type assertion succeeds, that type information is used to run a specialized implementation of the general algorithm. If the assertions fail, the fallback code path uses the generic At and Set methods. The fast-paths are purely a performance optimization; the resultant destination image is the same either way. In practice, only a small number of special cases are necessary to support typical applications.